Summer holidays, 2015, began for me with two shy, lovely little girls who had come to our elementary school just a couple of weeks before the end of June. Though the family was from Burundi, they had been living in a refugee camp in Tanzania where the girls had been born and raised. The children knew no English, nor much about life as we know it in Canada. Our school administrator had very graciously given consent for me to use the school library to conduct some summer ESL classes. When I asked the boys, as best I could, if they would like to join the class, it was an immediate, “yes!”—like “what were you waiting for?” I was correct about the changes in dynamics. Children are children, and siblings are siblings, no matter if they are from a refugee camp or a thriving city. More so than the academic challenges, it was these relational dynamics that changed the atmosphere. I loved how the children stuck together and obviously cared deeply for one another, but, as in any family, siblings can squabble, hurt and be hurt at any given moment. Usually I had no idea what had or was happening, but overall the ties that bind served to knit us all together as the summer melted away, and I counted my blessings to be there. I’m sure that I learned as much as the children did, not about “ABCs,” but about myself! Although I totally believe in making learning fun and interesting for the learner, I began to realize what an intense and demanding teacher I could be! I expected far too much of myself and, considering the background of these children with little or no English, and perhaps not a lot of schooling of any kind, I often expected them to make much greater and faster advancements than was possible. There was just so much I wanted them to learn, so that when school started in September they would find it a bit easier. If the shoe was on the other foot, however, and it was me learning Swahili, I’m sure that the learning would be near impossible! So, while the children persevered with the multitudinous tasks, (as exciting as I could come up with), I persevered in learning to control my expectations and my mind, which raced with endless possibilities and creative ideas that might be incorporated into the class. All of the ideas, of course, demanded a ton of preparation, which I rather enjoyed doing. What touched my heart each day was to see the children, no matter how early I arrived, sitting in the park waiting for me, or hurrying along their way as they walked to school. Sometimes the days fell into place beautifully and the learning progressed well. Other times I felt like pulling my hair out, as what I thought the children had grasped the day before seemed to have vanished entirely! I thought that “colours” would be an easy place to start, but no matter how many activities we engaged in, or how many games we played to teach the colours, the sky remained green, the grass was blue and the sun was red. But we persisted with more games, more activities, and more printing of words, until finally one day, the sun turned yellow and stayed that way! It was the same with the days of the week. Learning the names of the seven days of the week and keeping them in the correct order was a momentous task. I began to wonder if perhaps in a refugee camp the days just all run together and there is no real order or division for time, days and weeks. Then it happened! The children arrived at school one morning and they all knew that it was Tuesday, and that Monday was the day before, and that tomorrow would be Wednesday! I think they had practised before arriving at school and were thrilled to see how pleased I was with them. The day I brought a whiteboard to school and allowed the children to write on it was another turning point. There wasn’t a whiteboard in the library where we had our classes, nor was there a blackboard or smart board, just hundreds of books that the children couldn’t read because they didn’t know the words or meanings of the words, the letters or sounds of the letters. Slowly that all began to change as we hopped over letters that were spread out all over the floor and bounced a basketball from one to another hollering out letters. We matched letter cards—uppercase and lowercase, we sang the alphabet song, glued letters onto long strips of paper and wrote words under the letters. We played ABC Bingo and Word Bingo and celebrated with bubbles. We unscrambled sentence strips and printed letters and simple words on miniature whiteboards and in our journals. 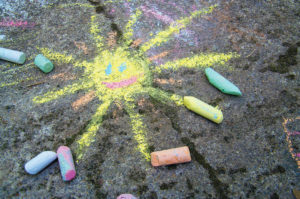 We wrote letters with sidewalk chalk and painted them on a huge strip of paper in the parking lot, dancing around with scarves blowing in the wind, as we sang “Yellow is the Sun.” We played little musical instruments, marching in parade around the library and right out the door to the park. Then we wrote “d” for drum, “t” for tambourine, “c” for cymbal, etc. We traced our bodies and labeled the parts and played a body card game. We sang “Head and Shoulders, Knees and Toes,” and “Sunday, Monday.” We ate snacks, “a” for apple, “b” for banana, “c” for cookies, etc., and we cut them in halves, quarters and eighths. We worked on simple math, adding and subtracting and indulged in stickers and more stickers! We matched words and pictures, and pictures and words and wrote “the fat cat sat on a mat,” (wearing a blue hat), and gave ourselves a pat, until everyone would pretty much remember it for the rest of their lives, and I could take my poor little black, stuffed cat home. Finally the lights began to turn on and I could see it in the children’s eyes, that Yes! the letters were starting to flow together to make words, and the words were starting to flow together to make sentences, and Yes! maybe it was all worth the hair pulling and the mind wracking. I could see the smiles glowing on the faces of the children, some English words just spilling out of them spontaneously, and the confidence level picking up. I let them take turns being the teacher, writing simple sentences on the whiteboard and saying, “Everyone look, read: “The sun is yellow.” These were moments when I wished that the summer would never end, wished that we could keep on going like this forever. I loved the wonderful look of understanding that appeared on Esther’s face more often. I loved the spontaneous giggle that Victoria filled the days with, and how she bounced around the room in anticipation. I so appreciated Manuel’s mature attitude and eagerness to learn, and his patience with his three younger siblings. Although Jonas seemed to know very little to begin with, and rather seemed to think that this was all just a fun summer club, he also blossomed into an eager student, excited about learning. And me? What can I say? It was an experience that stretched me far beyond what I felt capable of. It was an experience that helped me to see myself more clearly, and to accept the weaknesses along with the strengths. It was, I’m sure, the most fulfilling, wonderful summer that I’ve ever experienced, and the memories of the children, the letters, the words, the songs, will dance fondly in my heart forever! And in the years to come, I hope that the children will forget the moments when I may have seemed impatient or too strict, and that they will remember instead, the tambourine, the drum, the parade that marched right out the door, the ties that bound us together, and I hope they will fondly remember, as will I, the day the sun turned yellow. Sharon has enjoyed working as an Educational Assistant for Edmonton Public Schools for the past 18 years and is presently employed at Queen Alexandra Elementary School.